Lauren was raised on Cleveland’s “West Side” where her paternal Great Aunt taught Lauren and her sister how to embroider. 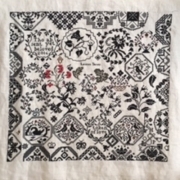 She remembers beginning on stamped Tea Towels at around age 7, and has been embroidering ever since. Her formal education was completed at Jane Addams Vocational High School where her focus was on fashion design/illustration and dressmaking/tailoring! She also attended Cleveland’s Institute of Art during her summers. Upon her graduation from High School she won an Eva’s Wingert Scholarship to the Fashion Institute of Technology, majoring in journalism and fashion communications. After graduating in 1966, Lauren returned to Cleveland to work at the May Co. as an assistant buyer of girl’s pre-teen clothing. 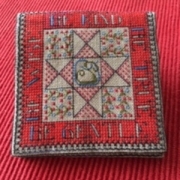 She began designing Counted Cross Stitch in 1978, opened a shop offering classes in 1985, and has since been teaching throughout the USA and abroad. Although Lauren no longer has a shop she continues to teach at local EGA, Specialty Shops, and Special Event Weekends such as Celebration, Sampler Gathering, and Just Cross Stitch Williamsburg. 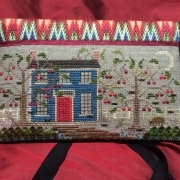 She has also been featured in Fine Lines, Early American Life, and Just Cross Stitch. We are honored to have Lauren as one of our teachers.